The Rhode Island Bill of Sale Forms are considered legal documentation in the state of Rhode Island providing proof of the legal sale and purchase of any item, mechanical or personal property. The forms will provide information regarding the seller and buyer, as well, the forms will prove change of ownership and specific identifiable information with regard to any item sold and purchased. These forms will require notarization and in some cases will be required for registration. Vessel Bill of Sale – This document will prove the legal sale, purchase and change of ownership with regard to a vessel/boat in Rhode Island. 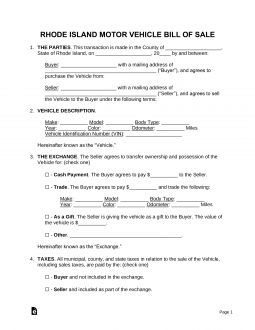 General Bill of Sale – This form is generally used between two private parties in the sale and purchase of personal property. Firearm Bill of Sale – This is a document that will provide identifying information regarding a firearm and information regarding the seller and purchaser. Will also prove change of ownership. Vehicle Bill of Sale – This particular document will provide information proving that a vehicle has been sold and purchased legally. It may be required for registration in proof of ownership. This form must be notarized. Be prepared to pay all title and registration fees at the time of registration.